In order for the data gathered by an organization to be valuable the organization must have the ability to effectively analyze and report on that data. Distill your data into valuable information easily communicated to stakeholders through dashboards, reports, scorecards and “on-the-fly” ad hoc analysis with the HSE Analytics platform. The HSE Analytics platform is based on gold standard technology (IBM Cognos) and is accessible through either an internal deployment or over the internet through a secure environment hosted by HSE Analytics. The HSE Analytics platform is a cost effective solution to generating and communicating the information your organization requires. Contact us for an on-line demonstration of the HSE Analytics Platform or samples of any of the example outputs described below. Employer performance ranking reports allow employers to investigate how their performance overall, or specific to a health and safety issue (e.g., motor vehicle accidents), compares to their peer group. This information is extremely valuable in identifying areas to focus health and safety resources. 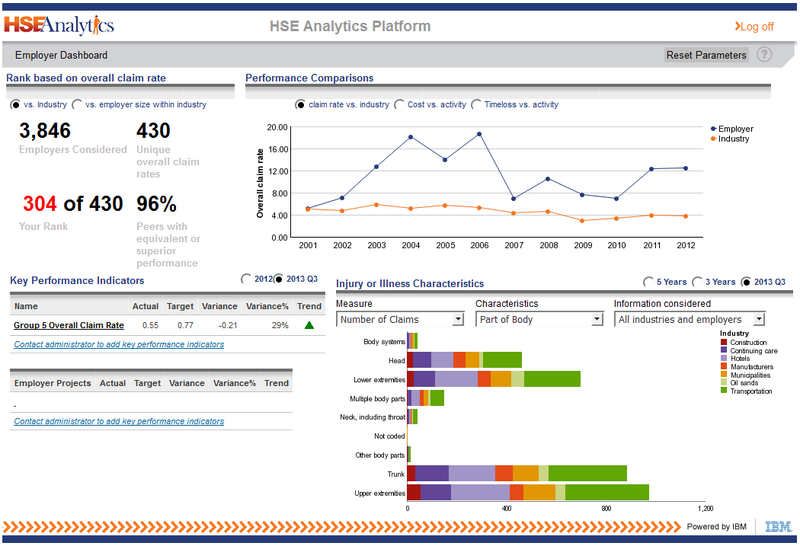 Analysis Studio is the ad-hoc analysis component of the HSE Analytics Platform. Using Analysis Studio users are free to perform their own multi-dimensional analysis in order to obtain answers in real time. Using Analysis Studio it is possible to completely explore an issue or trend to reach consensus and enable informed decision making in a single meeting. 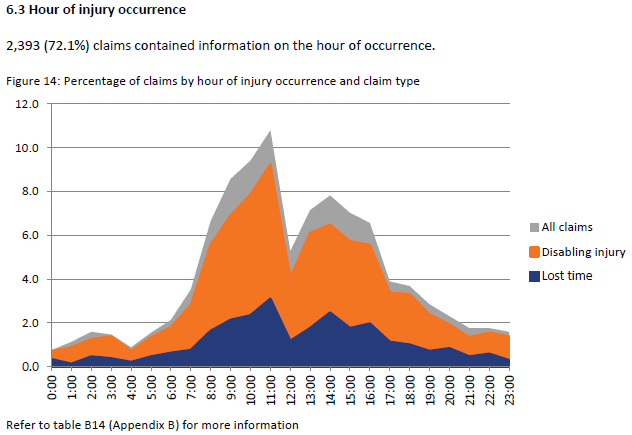 The employer performance heat map illustrates both the number of claims which have occurred and the risk of injury in a group of employers or facilities. This report can be generated based on overall performance or performance specific to an issue (e.g., low back injuries). 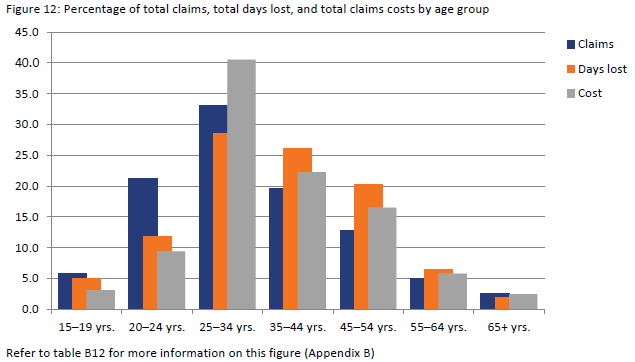 Providing information on both number of claims and performance in a single visualization allows the user to understand the magnitude of the issue in each employer and the potential impact of effective intervention. 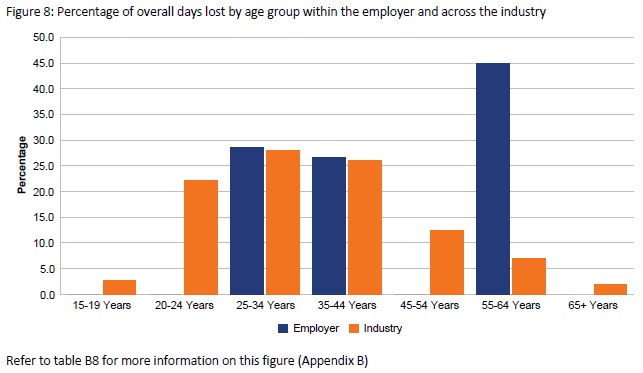 Employer benchmark reports provide insight into how the issues and trends observed within an individual employer compare to the issues and trends observed across the employer’s peer group (industry). These reports describe the comparative performance of an employer and highlight circumstances where trends observed differ significantly between the employer and its peer group. Level 2 issue reports describe issues and trends observed within an industry or group of industries in sufficient detail to facilitate the design of effective interventions. Level 2 issue reports may be created for any health and safety issue the user wishes to define. Level 1 industry reports summarize health and safety performance in observed within an industry. It is the purpose of these reports to provide a description of overall health and safety performance and identify issues and trends for further investigation. The safety association dashboard allows users to monitor Key Performance Indicators describing performance overall and relative to specific programs (e.g., young worker program). The dashboard also allows users to investigate issues and examine historical performance. 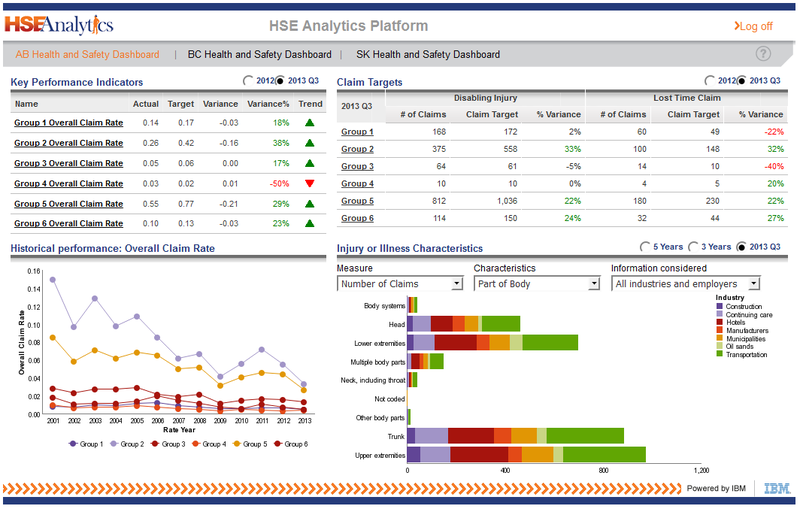 The nature of the HSE Analytics Platform allows dashboards to be quickly created and modified to user needs. 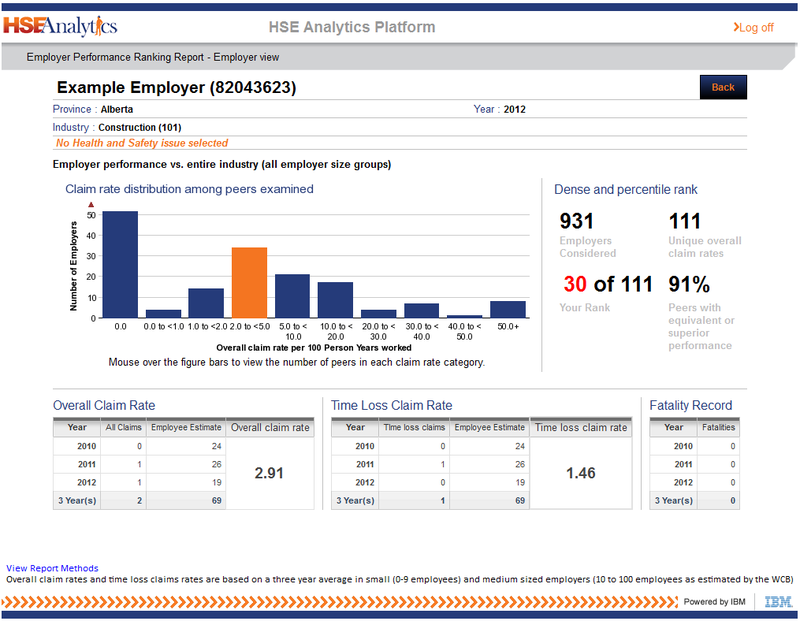 The employer dashboard is designed to provide performance information relevant to an employer. 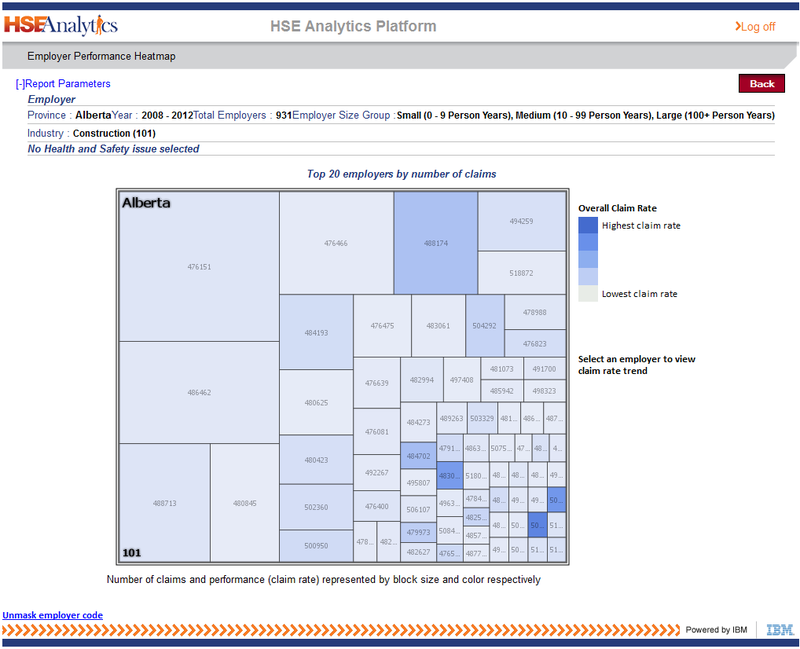 The employer dashboard may be set to display information describing performance in British Columbia, Alberta or Saskatchewan (should the employer operate in several provinces).